Vehicles remain a huge global pollutant, pumping out 28.85Tg of CO2 in Maharashtra alone, according to a study by the Indian Institute for Science in Bangalore. However, vehicles cannot be discarded, as they form the lifeblood of the country’s towns and cities. Between electric vehicles and hybrids, work is being done to help rectify the situation by making use of green car fuel and technological advancements. Emissions continue to be a huge issue, and there are two main options for helping to rectify that. The first is electric, which is seeing widespread adoption; and the second, biomass fuel, for more traditional vehicles. Between the two, excellent progress is being made, but there’s much more to be done. Electric cars are favoured heavily by the national authorities. A recent Times of India report outlined how the government is aiming for an all-electric vehicle fleet by 2030 and is pushing this through with up to US$16m of electric vehicle grants this year. Green vehicles are obviously a great choice, improving in-city noise and air pollution whilst providing better vehicular safety to boot; a study by the USA’s MIT suggested that electric vehicles are all-around safer than combustion. However, where EVs fall down to some extent is through the energy they use. As they are charged from the electricity grid, this means that the electricity is largely derived from fossil fuels – official statistics show that India is 44% powered by coal. Ultimately, however, this does mean that emissions are reduced. Fuel is only burned at one source, and oil refining isn’t done at all, which is another source of pollutants. However, as time goes on and the government’s energy policy changes, EVs will continue to be a great option. Biofuels are seeing a huge growth in use – BP has reported that globally, ethanol production grew 3% in 2017. Biofuel is commonly a more favoured option by the big energy companies given the infrastructure often available already to them. While biofuel has been slow on the uptake in India, despite the massive potential available for production, there are now signs this is turning around with the construction of two US$790m biofuel facilities. The big benefit of biofuel is that it will have a positive impact on combustion and electric vehicles. The Indian government has stated they intend to use biofuel alongside coal production, with as much as 10% of energy being created using biofuel. Therefore, despite not being emission-free, biofuel will provide a genuine green energy option to both types of eco-friendly vehicle. Green car fuel is not entirely clean. The energy has to come from somewhere, and in India, this is usually from coal, gas, and oil. However, the increase in biofuel means that this energy will inevitably get cleaner, making green car fuel absolutely a reality. Cofiring of biomass with coal and other fossil fuels can provide a short-term, low-risk, low-cost option for producing renewable energy while simultaneously reducing the use of fossil fuels. Cofiring (or co-combustion) involves utilizing existing power generating plants that are fired with fossil fuel (generally coal), and displacing a small proportion of the fossil fuel with renewable biomass fuels. Biomass can typically provide between 3 and 15 percent of the input energy into the power plant. 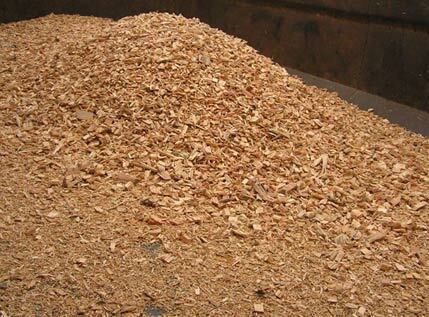 Cofiring of biomass has the major advantage of avoiding the construction of new, dedicated, biomass power plant. An existing power station is modified to accept the biomass resource and utilize it to produce a minor proportion of its electricity. Cofiring of biomass may be implemented using different types and percentages of biomass in a range of combustion and gasification technologies. Most forms of biomass are suitable for co-firing. These include dedicated energy crops, urban wood waste and agricultural residues such as rice straw and rice husk. The fuel preparation requirements, issues associated with combustion such as corrosion and fouling of boiler tubes, and characteristics of residual ash dictate the co-firing configuration appropriate for a particular plant and biomass resource. These configurations may be categorized into direct, indirect and parallel firing. This is the most common form of biomass co-firing involving direct co-firing of the biomass fuel and the primary fuel (generally coal) in the combustion chamber of the boiler. The cheapest and simplest form of direct co-firing for a pulverized coal power plant is through mixing prepared biomass and coal in the coal yard or on the coal conveyor belt, before the combined fuel is fed into the power station boiler. If the biomass fuel has different attributes to the normal fossil fuel, then it may be prudent to partially segregate the biomass fuel rather than risk damage to the complete station. For indirect co-firing, the ash of the biomass resource and the main fuel are kept separate from one another as the thermal conversion is partially carried out in separate processing plants. As indirect co-firing requires a separate biomass energy conversion plant, it has a relatively high investment cost compared with direct co-firing. For parallel firing, totally separate combustion plants and boilers are used for the biomass resource and the coal- fired power plants. The steam produced is fed into the main power plant where it is upgraded to higher temperatures and pressures, to give resulting higher energy conversion efficiencies. This allows the use of problematic fuels with high alkali and chlorine contents (such as wheat straw) and the separation of the ashes. The current use of agro biomass for energy generation is low and more efficient use would release significant amounts of agro biomass resources for other energy use. Usually, efficiency improvements are neglected because of the non-existence of grid connections with agro-industries. Electricity generated from biomass is more costly to produce than fossil fuel and hydroelectric power for two reasons. First, biomass fuels are expensive. The cost of producing biomass fuel is dependent on the type of biomass, the amount of processing necessary to convert it to an efficient fuel, distance to the energy conversion plant, and supply and demand for fuels in the market place. Biomass fuel is low-density and non-homogeneous and has a small unit size. Consequently, biomass fuel is costly to collect, process, and transport to facilities. Second, biomass-to-energy facilities are much smaller than conventional fossil fuel-based power plants and therefore cannot produce electricity as cost-effectively as the fossil fuel-based plants. Agro biomass is costly to collect, process, and transport to facilities. The biomass-to-energy facilities are smaller because of the limited amount of fuel that can be stored at a single facility. With higher fuel costs and lower economic efficiencies, solid-fuel energy is not economically competitive in a deregulated energy market that gives zero value or compensation for the non-electric benefits generated by the biomass-to-energy industry. Biomass availability for fuel usage is estimated as the total amount of plant residue remaining after harvest, minus the amount of plant material that must be left on the field for maintaining sufficient levels of organic matter in the soil and for preventing soil erosion. 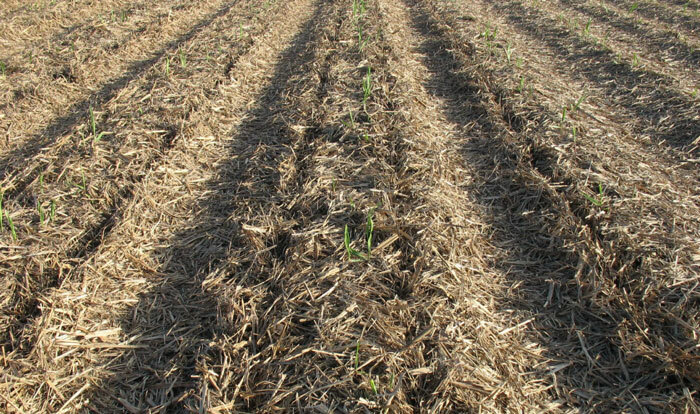 While there are no generally agreed-upon standards for maximum removal rates, a portion of the biomass material may be removed without severely reducing soil productivity. Technically, biomass removal rates of up to 60 to 70 percent are achievable, but in practice, current residue collection techniques generally result in relatively low recovery rates in developing countries. The low biomass recovery rate is the result of a combination of factors, including collection equipment limitations, economics, and conservation requirements. 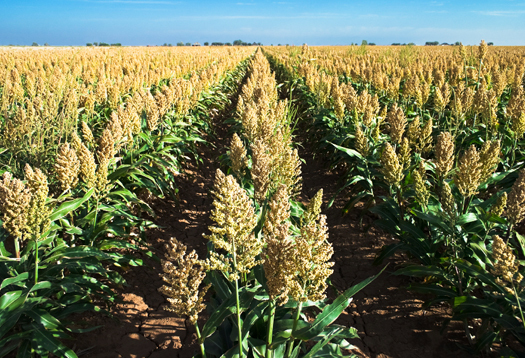 Modern agricultural equipment can allow for the joint collection of grain and residues, increased collection rates to up to 60 percent, and may help reduce concerns about soil compaction. Sugarcane trash (or cane trash) is an excellent biomass resource in sugar-producing countries worldwide. The amount of cane trash produced depends on the plant variety, age of the crop at harvest and soil and weather conditions. Typically it represents about 15% of the total above ground biomass at harvest which is equivalent to about 10-15 tons per hectare of dry matter. During the harvesting operation around 70-80% of the cane trash is left in the field with 20-30% taken to the mill together with the sugarcane stalks as extraneous matter. Cane trash’s calorific value is similar to that of bagasse but has an advantage of having lower moisture content, and hence dries more quickly. 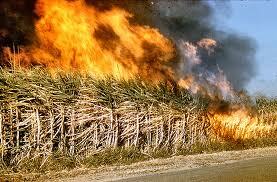 Nowadays only a small quantity of this biomass is used as fuel, mixed with bagasse or by itself, at the sugar mill. The rest is burned in the vicinity of the dry cleaning installation, creating a pollution problem in sugar-producing nations. Cane trash and bagasse are produced during the harvesting and milling process of sugarcane which normally lasts between 6 to 7 months. Cane trash can potentially be converted into heat and electrical energy. However, most of the trash is burned in the field due to its bulky nature and high cost incurred in collection and transportation. Cane trash could be used as an off-season fuel for year-round power generation at sugar mills. There is also a high demand for biomass as a boiler fuel during the sugar-milling season. Sugarcane trash can also converted in biomass pellets and used in dedicated biomass power stations or co-fired with coal in power plants and cement kilns. Currently, a significant percentage of energy used for boilers in sugarcane processing is provided by imported bunker oil. Overall, the economic, environmental, and social implications of utilizing cane trash in the final crop year as a substitute for bunker oil appears promising. It represents an opportunity for developing biomass energy use in the Sugarcane industry as well as for industries / communities in the vicinity. Positive socio-economic impacts include the provision of large-scale rural employment and the minimization of oil imports. It can also develop the expertise necessary to create a reliable biomass supply for year-round power generation. Recovery of cane trash implies a change from traditional harvesting methods; which normally consists of destroying the trash by setting huge areas of sugarcane fields ablaze prior to the harvest. There are a number of major technical and economic issues that need to be overcome to utilize cane trash as a renewable energy resource. For example, its recovery from the field and transportation to the mill, are major issues. Alternatives include the current situation where the cane is separated from the trash by the harvester and the two are transported to the mill separately, to the harvesting of the whole crop with separation of the cane and the trash carried out at the mill. Where the trash is collected from the field it maybe baled incurring a range of costs associated with bale handling, transportation and storage. Baling also leaves about 10-20% (1-2 tons per hectare) of the recoverable trash in the field. A second alternative is for the cane trash to be shredded and collected separately from the cane during the harvesting process. The development of such a harvester-mounted cane trash shredder and collection system has been achieved but the economics of this approach require evaluation. A third alternative is to harvest the sugarcane crop completely which would require an adequate collection, transport and storage system in addition to a mill based cleaning plant to separate the cane from the trash . A widespread method for cane trash recovery is to cut the cane, chop into pieces and then it is blown in two stages in the harvester to remove the trash. The amount of trash that goes along with the cane is a function of the cleaning efficiency of the harvester. The blowers are adjusted to get adequate cleaning with a bearable cane loss. On the average 68 % of the trash is blown out of the harvester, and stays on the ground, and 32 % is taken to the mill together with the cane as extraneous matter. The technique used to recover the trash staying on the ground is baling. Several baling machines have been tested with small, large, round and square bales. Cane trash can be considered as a viable fuel supplementary to bagasse to permit year-round power generation in sugar mills. Thus, recovery of cane trash in developing nations of Asia, Africa and Latin America implies a change from traditional harvesting methods, which normally consists of destroying the trash by setting huge areas of cane fields ablaze prior to the harvest. To recover the trash, a new so-called “green mechanical harvesting” scheme will have to be introduced. By recovering the trash in this manner, the production of local air pollutants, as well as greenhouse gases contributing to adverse climatic change, from the fires are avoided and cane trash could be used as a means of regional sustainable development. 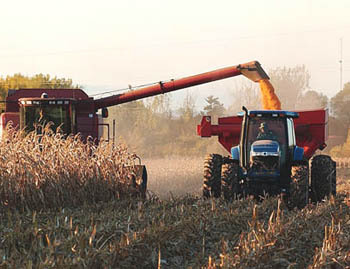 The sugarcane harvesting system in Cuba is unique among cane-producing countries in two important respects. First, an estimated 70 % of the sugarcane crop is harvested by machine without prior burning, which is far higher than for any other country. The second unique feature of Cuban harvesting practice is the long-standing commercial use of “dry cleaning stations” to remove trash from the cane stalks before the stalks are transported to the crushing mills. Cuba has over 900 cleaning stations to serve its 156 sugar mills. The cleaning stations are generally not adjacent to the mills, but are connected to mills by a low-cost cane delivery system – a dedicated rail network with more than 7000 km of track. The cleaning stations take in green machine-cut or manually cut cane. Trash is removed from the stalk and blown out into a storage area. The stalks travel along a conveyor to waiting rail cars. The predominant practice today is to incinerate the trash at the cleaning station to reduce the “waste” volume.